In one of my previous posts I talked about the endeavor I started on towards not being a lazy individual. 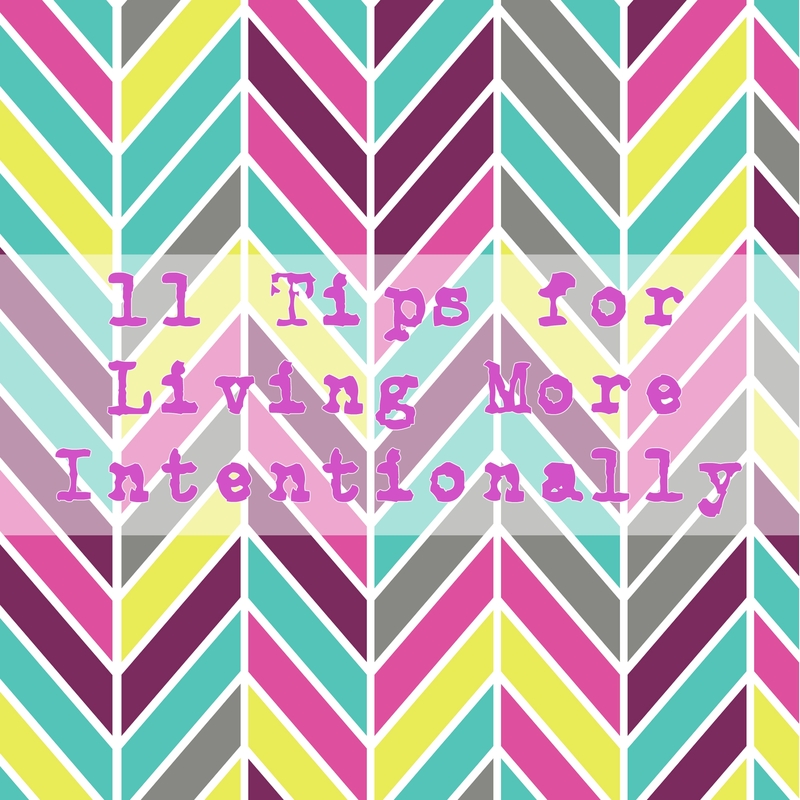 I have come up with a few tips that have helped me start to live a more intentional life. This does not mean that we will never again order take out when I have something healthy planned, but if it happens less that is a win in my book. Too many of us, me included, get into this terrible rut where we burn the candle at both ends, staying up late and getting up early. When Cody is gone I catch myself staying up till 5 am and then I have to get up at 8:30 to go to work. Yikes. If we want to live intentionally, we need to get our sleep. The easiest way to start the day off on the right foot each day, is to prepare for it the night before. Getting in the routine of laying out your clothing, making tomorrows lunch and making your to do list is a great way to do this. I find having good routines really help me live more intentionally. That is why I made another tip just for this. Putting some key areas of your life on auto pilot will really help make sure those things get done. My morning routine is still getting refined but I thought I would share it as an example. Morning: Wake up and don’t hit snooze, let our dog Beauty out, go to the bathroom, brush my teeth, put moisturizer on and change into the clothing I laid out the night before. I then make the bed, go let Beauty in, feed her and mix my Plexus pink drink. Then its off to my office to start the day. As my husband can attest, I love lists. What I have just started doing is prioritizing the tasks on this list and making multiple ones. Now I have a “Today @ Home” list, “This Week @ Home” list, and an “Out & About” list. I use an app called Wunderlist that is absolutely amazing and free. You can make as many lists as you want and move the task easily, even adding a due date and notes with a simple click. One thing I should mention is that if you plan on doing 10 loads of laundry, spread it out and list each load individually, identifying each load by what its contents will be, this will help you feel like you have accomplished more. I don’t know about you, but I don’t always finish my to do list, so determining the most important items that should get done and then doing them first is important. Being intentional is all about motivation. If you feel like you fail every day, then you will give up. That being said, determine your win for today, put a star by those tasks and when you accomplish them rejoice. Don’t allow yourself to wake up with yesterday’s issues troubling your mind. Refuse to live backwards. See everyday as a new chapter. I’m so competitive with myself. I just stated setting the timer and see how much I can get done in fifteen minutes. Implementing the timer keeps me from spending too much time on tasks that don’t deserve too much of my time. I have even started setting a timer for my workouts and this has helped me feel more comfortable in taking time out of my day to do it. We don’t have to schedule only dental appointments and birthday parties. We can schedule anything that is important to us. I have started to scheduling my workouts, walking Beauty, me time, healthy meals and anything else I might want to do like getting those pesky to do items done. This practice will help us live a more intentional life because in doing so we will identify what is really important to us. My family and my health is what is important to me, so I schedule date nights with Cody, healthy means and workouts to ensure that I get done what I find the most important. When I think about skipping one of these scheduled events…. usually my workout I think about something that motivates me to complete the task. When it comes to working out I remind myself that no one ever works out and regrets it. I have never gone to Zumba, danced my heart out and then when I’m finished wish I stayed on the couch. We should never be content to stay where we are, whether you have 100 pounds to lose or are in perfect shape, we can all benefit from working out and getting not only the health but mental benefits of doing so. What’s important to you and how to you stay motivated to complete it? I’m terrible at checking the mail and then leaving paper on the counter that should really be dealt with a that moment. Open the mail, pay the bill and mail it out! I also do this with bringing in the groceries, now I bring them all in, put them away and then put away the bags. The key is to handle something once, until completion. Cody and I love going through things and throwing away or donating items we no longer need. Sometimes we even sell things on Craigslist or Next Door and make a little extra cash. This tip will help you live more intentionally because you won’t be forced to dig around though tons of things to find what you are looking for. Putting things back in their place will also help with this. Nothing should be floating around your house. If it doesn’t have a home, then it’s likely not something important. You find a place for those things which are important. If it’s floating around, you need to deal with it. Find it a home, give it away, or throw it in the trash. Deal with it and make sure everything has a home. Besides less stuff always means more efficiency. We have always been taught that multitasking is good, but sometimes it distracts us from getting one task all the way complete. Don’t move onto something new until you’ve finished the current task you are on. You’re not finished with breakfast until the dishes are done. You’re not finished getting dressed until the dirty clothes are put away and the bathroom wiped down. Finish what you start. Completely. Don’t be one of those who say, “If I don’t do it, it won’t get done right.” Let it go. Lower your expectations if you need to. Allow others to help you. Your are manager of your home. Not doer of all things. If you have children, give them simple tasks to help you finish your to do list. Talk to your husband about how he can help around the house, Cody likes it when I tell him all the things that need to get done and let him chose which task he will start with. We just started this new thing were at the end of the night we tidy up the house before bed and using a tip from above we schedule 45 minutes to do this. We start with what is most important first and then we time it up, we head to bed. Well, those are my tips. Are you going to start trying to live more intentionally? If you already do, what tips would you share? “When it comes to working out I remind myself that no one ever works out and regrets it.” — This was basically the advice a friend gave me when I asked her how she got up at 4am to run. My reaction was, but I’ve never regretted an extra hour of sleep, either. Which just means that you have to find what works for you (and it’s easier for me to do my workouts after work). My workout motivator when I’m feeling lazy is, “I’ll just go easy today. Moving is better than not moving.” Instead of running 2 miles, I might jog for a minute and walk for a minute for two miles. But usually the hardest part for me is just getting going, and when I start jogging, I have no problems keeping up the pace. Again with the momentum. Where do you go for Zumba? I totally agree, getting going is the hardest part. I go to the Zumba classes at “the Studio” in Edmond. It’s $5 a class or you can get a month is for like $20. ( Tue/Thur @ 6:30) I know that is close to you Autumn, but if you’re an out of towner, the Zumba website makes its easy to find classes near you.